The 2019 season is a milestone one for our organization, and because of that, we want to extend an invite to our former players, coaches and their families for a celebration at Bill Taunton Stadium! 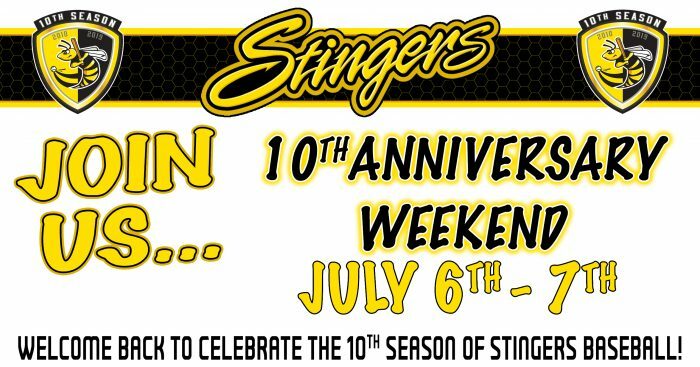 In recognition of the 10th season of Stingers baseball, we’d love to have you join us on Saturday, July 6th for an Alumni Celebration event. If you are able to make it to this celebration, please fill out this form below. This will give us your most current contact information and we will be able to keep in touch with you leading up to the game! Click here to RSVP for this Event Here!